Foundation (F1-F4) The system uses a non-traditional footing, only 14” wide by 10” deep for this design, and easily accommodates footing jogs and steps for the walkout design. The walkout wall uses a footing at only 24” backfill depth due to our design efficiencies, and no full grade wall is needed. Smooth and level footings are surfaces with peel and stick membrane before predrilled track is bolted to the 72 hour cured footing. Footing design is included in our engineered packages. Foundation (F5-F12) Pre manufactured fully cut foundation wall sections matching all required window and door openings are picked and placed in accordance with numbered drawing and section tag numbers. Traditional bracing is used to hold partially erected walls in place, and supplied top brackets hold floor system rim and joists pulled back from exterior walls to allow future outside rim joist face insulation. Panels are easily lifted and placed without equipment, standard steel stud construction fasteners and drills used to assemble. Traditional floor systems are attached with traditional nailing procedures to top plates of the system walls. Main Floor (M1-M5) Pre manufactured wall sections are lifted onto the deck, then placed and attached using methods and procedures as done on the foundation level. 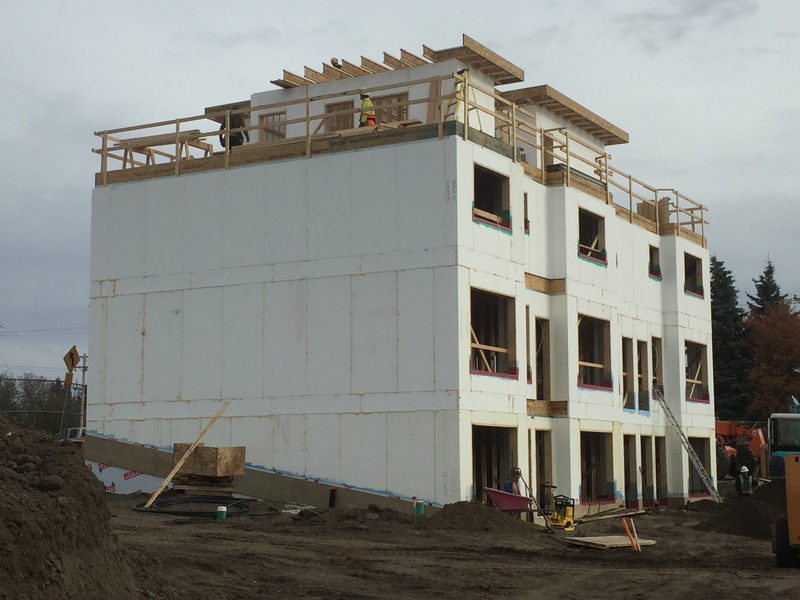 The 60’ x 35’ triple unit full level exterior walls can be installed by a crew in 1-2 days, resulting in fully insulated ready to install window walls for the entire level. Internal unit and demising walls are installed prior to the next level floor deck. Second Level (U1-U4) Walls for the second level are staged onto the deck, and installed using methods now fully understood by the crew which was new to the system only two levels back. Base track is fastened to the floor deck, panels are placed and braced, and the exterior walls for the level are nearly complete in only one working day. Internal framing of demise and unit walls are then installed and joists for the cap of this level are attached. Upper Levels (V1-V9) The upper level, a combination large deck area with some walls for enclosed roof areas of the units, includes dual height wall sections precut at the plant for all openings. Walls are erected, braced, and capped. The no-attachment exterior surface is T1 Stucco grade EPS – allowing for the direct application of acrylic stucco after sanding and mesh. The monolithic walls reduce labor and material cost associated with EIFS installation on wood structures to provide a superior finished wall and exterior coating that eliminates possible water intrusion that would be an issue with layered systems. Summary – Overall, the system installs a full exterior envelope (structure and insulation) in one step. Larger projects benefit from the ability to have other crews such as electrical, windows, or mechanical, working one or more floors below the envelope installation crew at the same time, collapsing long “one crew followed by one crew” construction schedules into multi-crew faster completion projects.